The first memory of Durgapuja in my mind is of Purulia Express, along with a huge pile of the crowd, jostling with the urgency of an army evacuation on the 8 number platform at Howrah Station. Everyone is struggling to get a seat on the train. Not the fancy window seat, not the comfort of a sleeping berth. All of them, the homebound humans on the eve of Durgapuja, wanted a seat for the next three to eight hours of train-journey whose time would last depending on the whim and fancy of the mighty South Eastern Indian Railway! Thailand? Naaye! This is one of the numerous Durga puja pandals in Kolkata. Deshbandhu park near Rasbehari Mor, South Kolkata, 2017! 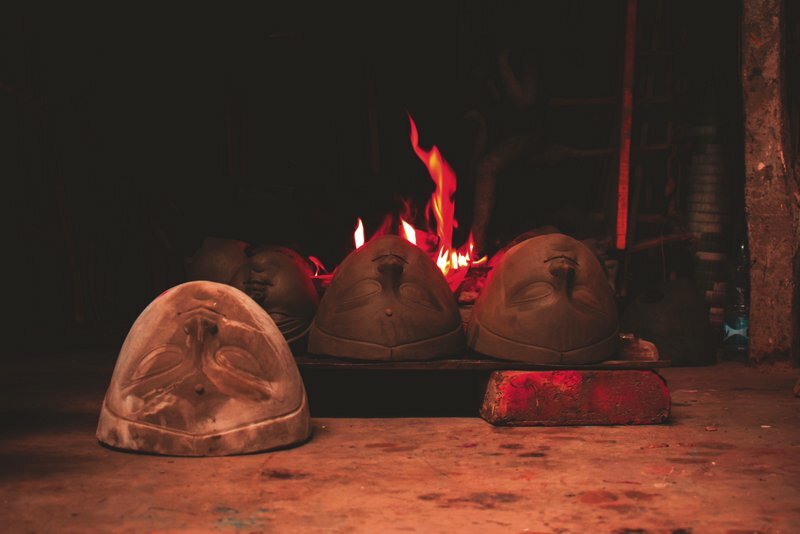 Suggested read, A Photowalk in Kumartuli area, where Durga idols are made! At five years of age, all I cared for was my brother should not get missing in the crowd. He would cling to Maa’s saree and look at the people with eyes the size of a chicken egg! We would reach Bankura at the wee hours on Panchami, after an express train speed which I would believe to exceed that of Rajdhani for my entire childhood (yes, my childhood was a lie!). The next few days would be a melting pot of emotion and fun with cousins who gathered from all parts of the country with their parents. 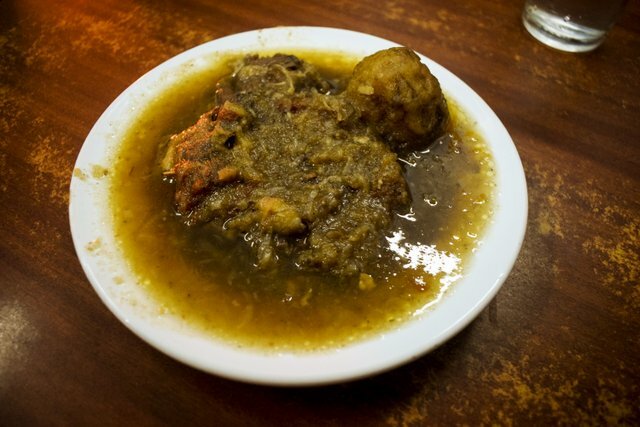 A mutton stew I had in the cafe by the Jatin Das Metro station. Staying true to the old school Anglo Indian vibe, the eaterie practices recipe they cooked back in the British era. Do note the piece of potato in the gravy! Durgapuja has long ceased to be an all-vegetarian affair for us, Bengalis! Also read, the fuming streets in Bangalore during Ramadan! Our family, the typical 90s Once-a-joint-family-but-now-a-transient-nuclear-module, were very happy to be indoors during Durgapuja, busy with breakfast of Luchi and Motordaal and making the perfect Bhuni Khichuri for lunch! Life was easy. Durgapuja shopping meant 8 to 9 dresses gifted by relatives which will last the upcoming months, other festivals and the cousins’ wedding. I remember buying a “Titanic gown” once and a “Haam Aapke Hain Kaun” frock too! The grandeur of Kolkata Durgapuja staged herself in front of me the first when I left the city of joy in search of a job! Diwali in Delhi did not impress me much. There was little engagement beyond individual families which meant I stayed mostly indoors peeping through the window to take a lingering glimpse at the neighbours bursting crackers. That moment when I realised I can live nowhere else but in Kolkata during Durgapuja! 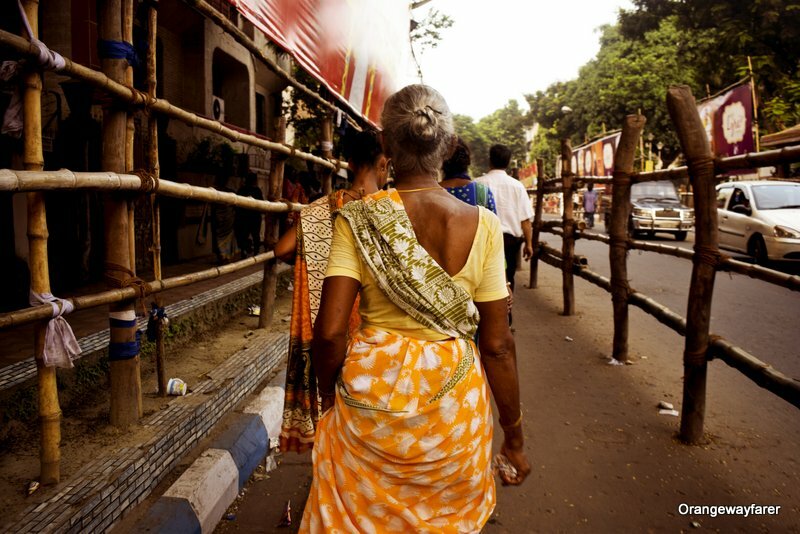 Also read, the finest of Indian weaves you need to check out during your travels in India! Then it occurred to me. 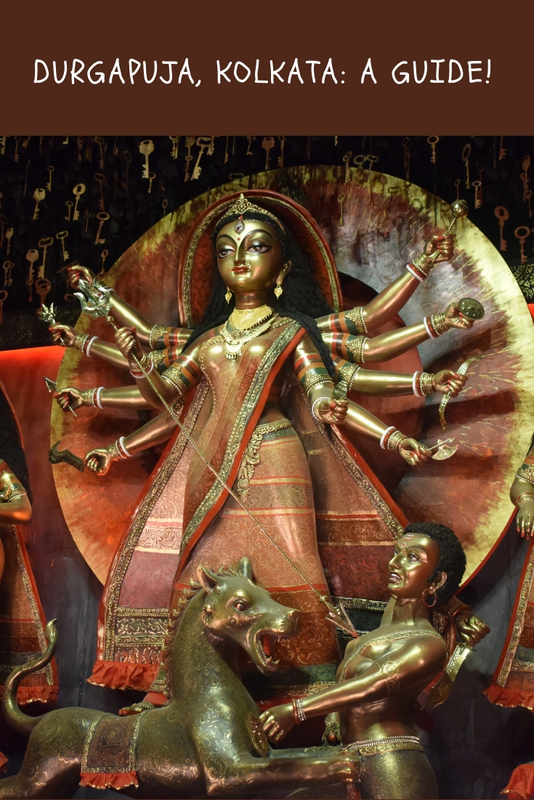 Durgapuja is surely a modern-day enigma where the receding consumer-focused number of industries see a profound scope to take the share of the pie of Bengal’s market. The new year in Times Square meets Milan Fashion Week meets Venice Festival in Kolkata Durga puja! Books, beer, film, music galore besides the faithful lot! Durgapuja is surely a Hindu festival. There is a god Shiva, a goddess Durga. Durga has a family of 4 children. It is believed she lives in the mountain but takes a break from regular Shongsaar (the tedious family life of a homemaker, you know) and comes to her mother’s home, which is Bengal. If you notice carefully, you will find a muscular dark-skinned man resting at her feet with the trident going straight through his chest. Blood oozes out of the wound. Often, he will strive to take a shape from the corpse of a buffalo, with fancier horns than its African counterpart. Her lion will stand triumphant on the buffalo corpse too! The family of Durga Thakur! From leftmost: Ganesh, Lakkhi, Durga, Saraswati and Kartik! Notice the lion and the trident and the Mohishashur at the lower tier! Just for your information, I have found a profound statue of Mohishashur being worshipped at Mysore, Karnataka as well. There are tribes in the Bengal-Bihar border who worship Mohishashur during the same time of Durgapuja! The elders had explained Mahishashur was not “Nice”. Devi Durga was created to defeat him. She was adorned with weapons from the who’s who of Hindu God fraternity. She came to earth to fight the dreaded Mahishasur, who came hidden under the skin of a buffalo. If you delve deep, there are problematic explanations of the Mohishashur’s defeated state, indicating a conflict between the son of the soils of the Indian peninsula and the invading Aryans. Castism and other ugly innuendoes of prevailing religious practice come into play. I have seen hundreds of people from different faith (and practising, visibly) visiting pandals with family. You do not necessarily have to participate in any ritual. You will be welcome and accommodated in the crowd of happy million! You cannot help but love the pandals! Durgapuja 2018 in West Bengal: Dates you Must Keep in Heart! 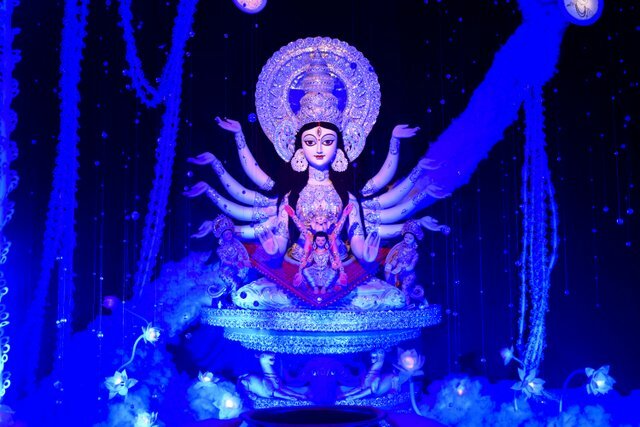 Traditionally, Durgapuja happens a month prior to Diwali. Diwali is when Kolkata celebrates Kalipuja but that is a different story! You can count on mid-October to have Durgapuja dates scheduled. Standing in the queue with people from around the Bengal who head to Kolkata on the eve of Durgapuja! I had bitten off all my nails while booking a flight ticket from Delhi/Bangalore to Kolkata during Durgapuja. It seemed, the price escalated since the beginning of the time! If it is a family of 4, and you are trying to book the flight tickets prior to 4 months of travelling, be ready to shell out a lakh or so to watch Durgapuja in her prime. Following are the hacks we generally practice to travel during Durgapuja from other cities of India/world in a pocket-friendly way! Travelling by the great Indian railway is a viable bait, especially during Durgapuja. In addition to meeting people from around the country, you get to eat sumptuous food. The train mostly runs of time. The railway also introduces a lot of “special train” at the onset of Durgapuja. Dynamic pricing is practised meaning the later you get a ticket the more expensive it becomes! Book a ticket 4 months prior to the travel, that is when the train booking window opens. Trust me when I say the seats get booked in the blink of an eye! The first class of Indian railway is pretty expensive and fits the fancy of discerning travellers. Airfare will cost you a bomb if you are trying to book a few days prior to Durgapuja. It is of the same price with which you can book a flight to Bali or Bangkok, at least from Bangalore. Tough choice but Durgapuja wins arguably for the Bengali tribe! Be vigilant and seek out online portals. There are credit cards and banks sharing budget deals to travel! Price starts to go on the steeper side from the start of Panchami in general, especially if it falls at the weekend! We book our flight tickets at least 6 months prior! Allow Your Time in Bengal with a twist! Just to make the time spent here bearable, I suggest allow some time either after or before the Durgapuja! You can take quick refuge to nearby areas of interest, spend a couple of nights before returning to the city of joy. Allowing the buffer time in Kolkata ensures you do not end up paying an exorbitant price for airfare. A terracotta Durga Idol I bought from Bishnupur. Bishnupur, the home to iconic middle-aged terracotta temples, also fits as a perfect short trip from Kolkata! The Kolkata elites, with the help of British East India Company, had started the grandeur of Durgapuja around a couple of centuries back. The British indulgence died down soon after, owing to an ongoing economic slump. It triggered the first ever Barwari (a collective of a locality) puja celebration. Crowdfunding took place from the richest to the poor. Committees were formed. The new age marketplace blended in along with political parties. 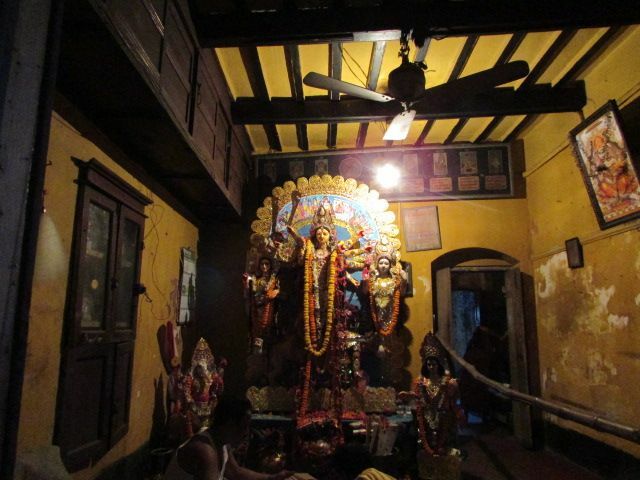 At present, Kolkata Durgapuja consists of thousands of Barwari Puja Pandals, while the Bonedi Barir Puja (the Kolkata elites, read once a zamindar/landlord) banks on the historic past and stages a show rich in heritage and unique customs. Also read, Kolkata Durgapuja, a melancholy! Your Durgapuja Puja visit in Kolkata must consist of both types of Durgapuja. While the Barwari Pujas dance on abstract themes or contemporary world happenings, Bonedi bari has been traditionally show-casing rituals dating back to antiquity! Yes, ranking Durgapujas has been a cherished practice in Bengal. There are traditional Pujas that has been doing great for years. Then there are newbies. 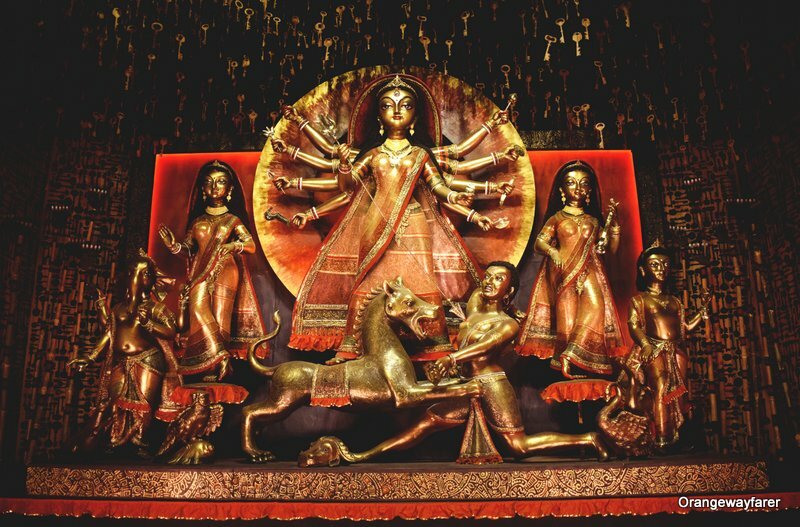 Every year, a few Durga puja committees think through the process and ongoings of the world, connect the dots, create a masterpiece of art and showcase it for the public for 5 days. Artists toil for months before the Puja starts. It is not only reverence or the quest of popularity that runs the show, but rewards are also involved in it! Kumartuli, where Durga idols are made. You must include that in your Kolkata journey! A fierce competition with artistic rivalry takes place. The concept of certain Durgapujas must be kept secret till the eve of Panchami. 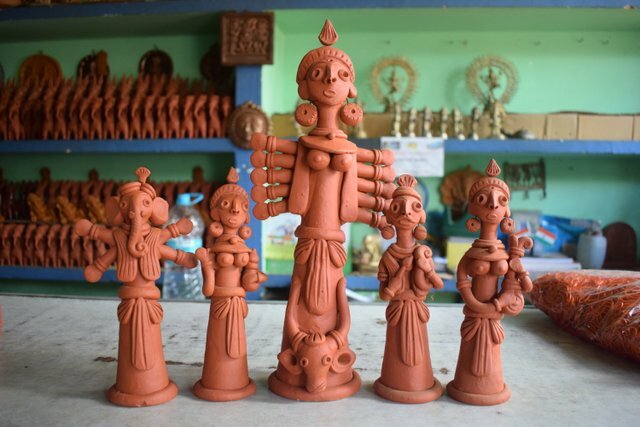 Post which the wise of the city sits together and weighs in the artistic endeavour, ranking Pujas and rewarding them more visibility as well as monetarily. The Hyped up Media of Bengal during Durgapuja! Kolkata Media goes crazy during Durgapuja! Not only the 12 long pages of newspaper primarily talks about the festival, but it also comes with large-scale ads of what to shop, where to eat and where to take the quick break from the maddening crowd of the city! Remember the Srileathers advertisement in the newspaper with plenty of shows in both men’s and women’s section? The Kolkata news channel probably will talk less about, say there is an Indo-Pak border conflict or cricket match going on (a huge event in Indian sub-continent) and only emphasise in Pandal hopping guide! One of the many Idols that will be instilled in the Pandal on the streets of Kolkata during Durgapuja. There are numerous pandals around the city. Some are huge, some are moderately sized. 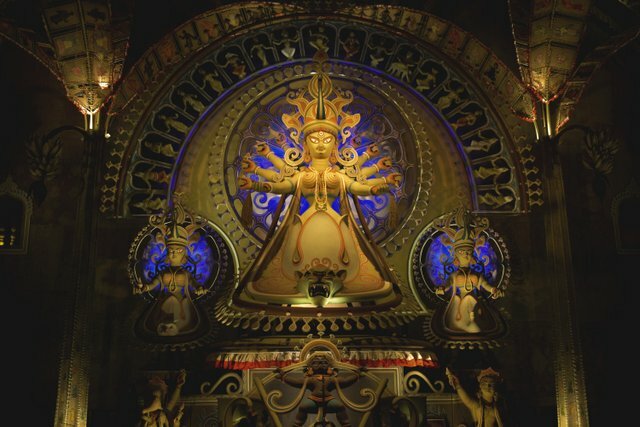 Durgapuja will come with new releases of art! From another disappointing Srijit Mukherjee movie to the launch of the swanky music video, produced by the new singer on the block investing her last saved penny, a youtube upload of alternate art and iconic theatres in Kolkata playing a classic play, you will never have any dearth of cultural overdose during Durgapuja! I suggest go watch a movie at Nandan, the first ever multiplex of India established during the previous communist government in Bengal! Follow it up by an evening play at Academy of Fine Arts! The way Bengalis do it: Consumerism much? As a child, I used to wait for the newspaper vendor ring the bell before Durgapuja. I knew he would not just roll the paper and throw it on that day, but he will come to the doorstep to deliver “Pujabarshiki“, a book, a special annual edition for the Puja. I will have Shuktara for the keeps. Dadu will get me an Anandamela. Pishu will get a Desh or Ganashakti. I will arrange for an Anandabazar from a friend! There, my puja shopping is complete! The market economy has spotted untapped potential in the Durga Puja celebration of Bengal. It tries to induce an insatiable urge to buy more, shop more, gift more, eat and drink more and more! So there, you cannot just do with three sarees for 5 nights of Durgapuja. You need to shop for “looks” as the fashion trends demands. The ever enriched market of saree weavers of Bengal try and make the most of annual revenue during the season. Honestly, it is consumerism which helped us transcend the religious identity of Durgapuja, in many ways. Durgapuja merges with Mutton Biryani and craft beer in a silk saree, seamlessly, for 5 days. And we love it like that! 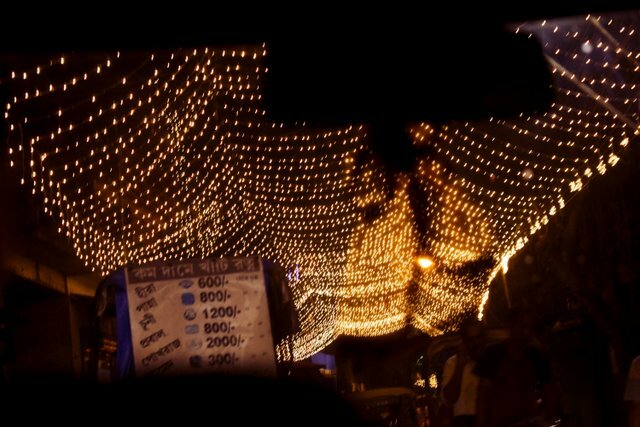 A road in one unnamed Para of south Kolkata during Durgapuja, all lit up! Beside curating sarees, Durgapuja is also the time when we Bengalis indulge in the following practice (and you should too if you want to do it like the locals)! 1. Hire a car for Puja Parikrama (the traditional name to take rounds of the city and see the idols) and pandal-hop for the entire night till the wee hours of dawn! The idea is to go for an “overnight” city ride, with pit stops at Puja celebrations and avoid the rush hours and the number of crowds! 2. Make sure to get done with reservations as you head to the famous eateries of the city, say Aaheli in Peerless Inn hotel or Sonar Bangla in Taj who diligently prepare Bengali thalis with the best of authentic cuisine, often reviving the traditional old recipes in the process. 3. An Ashtami night requires you to be present at a pandal and witness the Sandhipuja, the moment where Durga is believed to be Chamuda, another devi. Post which the famous Dhunuchi dance starts. Men and women will perform the dance in the rhythm of a dhaak with a Dhunuchi containing lit charcoal in their mouth! A spectacular scene, I tell you! 4. Durgapuja ends on a high note on the day of Dashami where women smear vermillion on each other’s face, marking Bijaya, a win against the evil and call it Sindurkhela. These days, the practice is prevalent among women irrespective of married! Be present in a pandal to taste the famous Bengali sweets! 5. Love is in the air! Last but not least, do not forget to fall in love during Durgapuja! We, as romantic (and deprived) high school students from an all-girls school, used to wait for the entire year to hold hands with the beloved on the eve of Panchami. In fact, my first date was on Panchami, in a moving tram over college street. I tell you, love and Durgapuja goes hand in hand. It seems as if the entire city is rejoicing in your romance, and celebrating it with brightly lit pathways! The Best Way to Spend Durgapuja in Kolkata! The city is huge. I suggest grab a map and highlight the Northern and Southern nerve points of Kolkata. Once you are done, choose a mode of transport. Durgapuja reckons eating great meals. 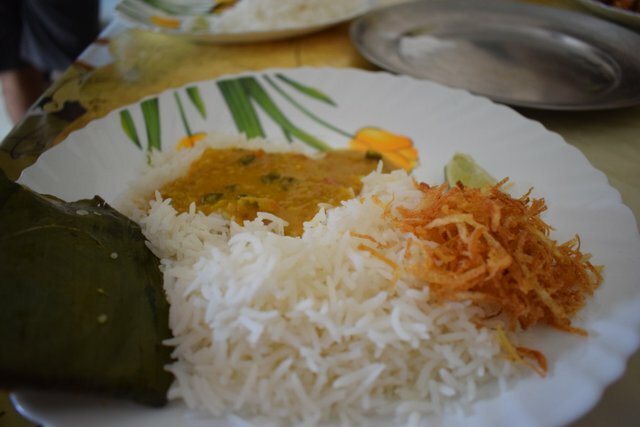 Here is my plate full of Paturi, a type of fish steamed wrapped in banana leaves, and finely shredded fried potato. During Durgapuja, Kolkata metro rail operates till late at night. Choose to commute by metro and rely on your feet to walk the remaining distance to the pandal. Choose to go up north on one day and south on the other! Bus and auto ply on shorter distance but they are whimsical. The “whole night” plans will require you to hire a vehicle. You have the luxury to start late at night and visit pandals on a thin crowd! I prefer this the best. Here is a list of my favourite Durgapuja celebrations that you must not miss! The list contains the glamorous Barwari committee Pujas of North Kolkata. Here is the Bonedi Bari Pujas you must not miss in North Kolkata! Durgapuja being performed at an old house as clicked from the Jatin Das Metro station in the year 2016! Though not as much as North Kolkata, South does have her own share of Bonedi Barir puja too! Here is a list! 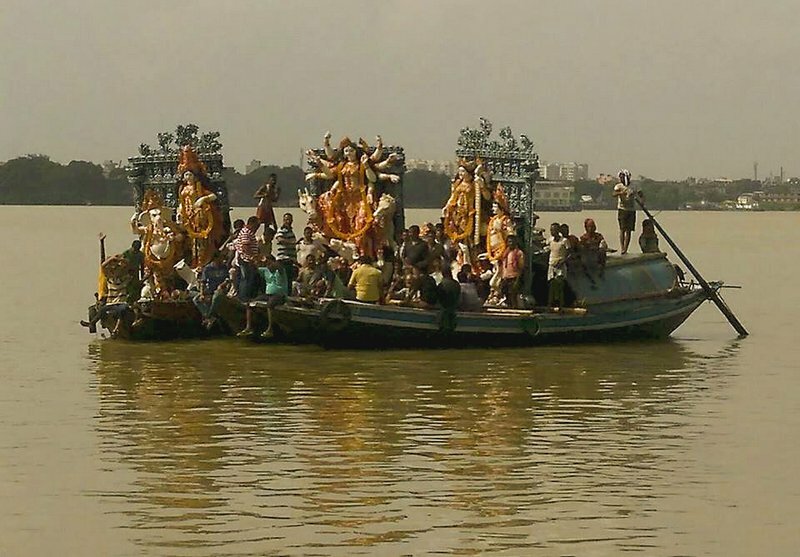 The Durgathakur of Bali Rajbari on her way, crossing the Ganges by a boat! Every state in Bengal celebrates Durgapuja with the same zeal and enthusiasm as Kolkata, though funding may not be as much. The number of pandals also gets receded. However, if you are road tripping through Bengal, I suggest tale a quick break to appreciate the different small-scale celebrations of Durga Puja which feels extremely cordial. On Dashami, the day of Bisarjan, the nicest way to witness Vasan or Bisarjan (the immersion of the clay idols in Ganges water) is to be present at Babughat or take the boat ride on the Ganges. If this is your first time in Durgapuja, I suggest choose a stay near the Chowrangee area. The metro route is nearby. The area is situated right at the heart of Kolkata. You choose to go to south or north of the city, you get the most strategic position. Being in Chowrangee also means you get to eat at all the heritage eateries of Kolkata. My favourite is Fish Florentine at Mocambo and Biryani from Shiraj. The crowd of Durgapuja can be overwhelming, even a bit daunting in the beginning! Assuming you are hiring a car to commute from one pandal to another, you will still need to walk with millions to enter a pandal and appreciate the intricate detailing of a “mandap”. 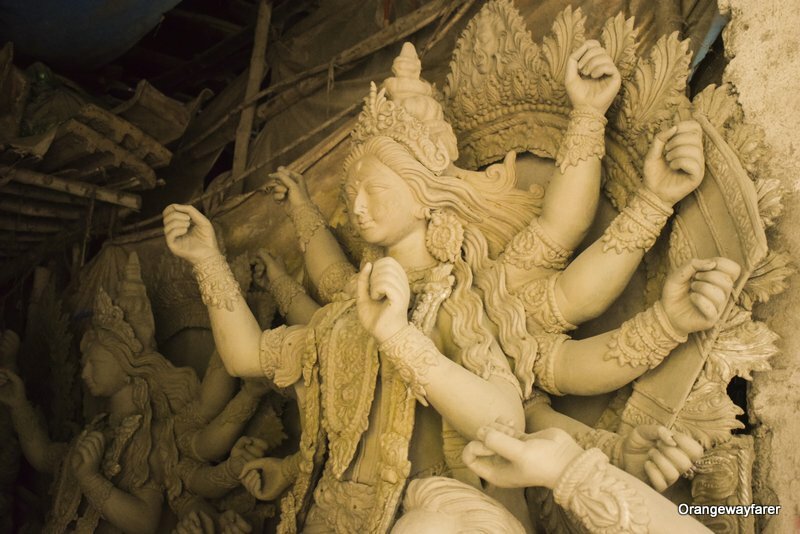 Here are the basic rules you must adhere to enjoy a safe Durgapuja! Do visit pandals at the dark of the night. Many of them go back home at that time. I experienced the thinnest crowd at 3 am during the 5 days of Durgapuja! Drink water. A lot of it to stay dehydrated. Kolkata is extremely hot and humid. Eat a lot of street food delicacies but know what your stomach can handle. Most of the food is overly greasy. The long queue in front of the pandals means a fair chance at being groped. Stay cautious. People are helpful in Kolkata. Police are active (women police are on duty as well). Seek help if you think you are being stalked or violated. Buy VIP passes from beforehand if you want to avoid the queue and enter pandals faster. Be a Responsible Traveller because You Care! Be kind to the city during this Durgapuja! The five days of festivity also comes with a heavy toll on the earth. Plastic litters are my eyesore. And to my distress, I find it everywhere! Kindly think once before taking that straw or plastic cup. The city serves tea in earthen cups. Choose that or a glass! Don’t leave your cigarette butts unattended. Remember the pandals are made of bamboo and straw and very much flammable! Want to book a stay for the next vacay in Kolkata? 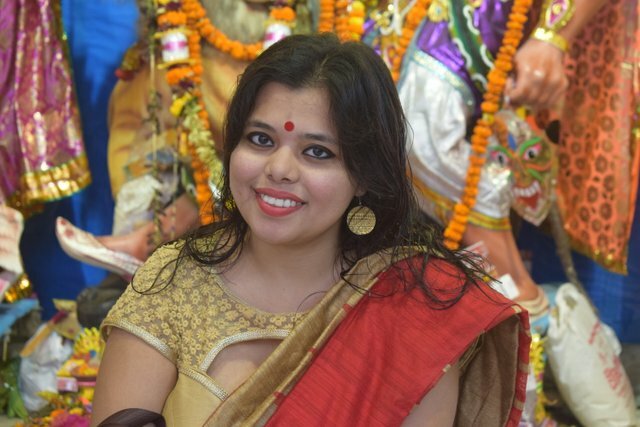 Here is a short video of previous Durgapujas I have lived through! 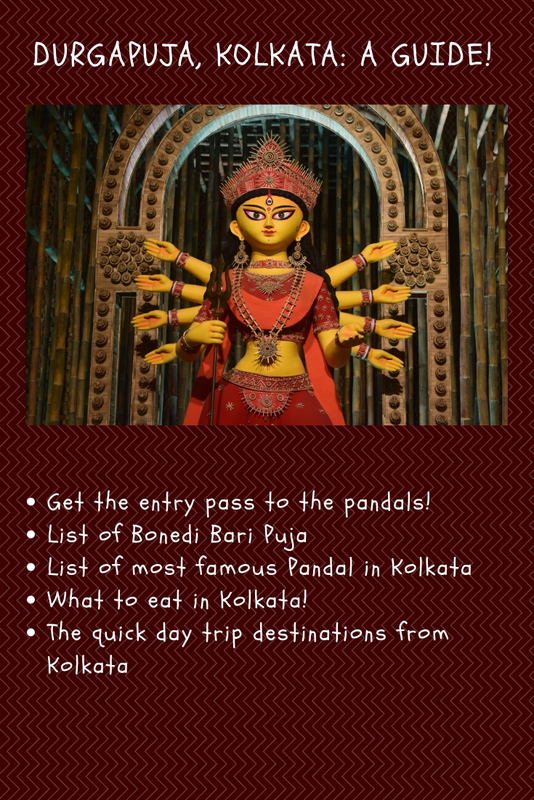 Planning a trip to Kolkata during Durgapuja? Pin it for later! Such a beautiful carnival! I so want to visit India and especially Kolkata during Durgapuja. Thank you for the inspiration! Loved your indepth guide. Fantastic pictures! This is brilliant… Everything you need to know in one page! You read the consumers needs, woman! And you never fall to inspire me ..
WOW, that white temple looks so much like the one in Chiang Rai! Very interesting read, although I have seen Durga Pooja celebrations but never like this in Kolkata. And I had no idea Mahishasur was worshipped in some states in India! Very interesting, something like Ravan in Sri Lanka. Sounds like an amazing celebration! I appreciate you adding some information about being a responsible traveller throughout Durgapuja too. Great write up! 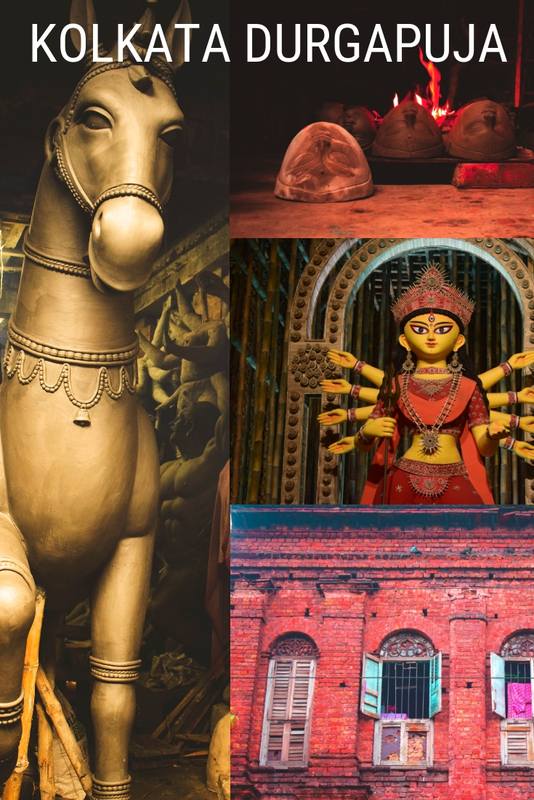 After reading your post – it is definitely TO BE in Kolkata 😉 The terracotta Durga Idol of Bishnupur are so beautiful. I totally want to visit Bishnupur and do a whole load of shopping!! What a spiritual trip, it looks lovely! Fascinating! I always love learning about the Hindu pantheon and that first picture really looked like the White Temple in Chiang Rai for a second! Awww, “pandal-hopping” sounds like a blast! Loved the video btw! Nice to go through your post. A few memories got refreshed. In Odisha too it is festive time. In fact the festivities start from Ganesh Puja and the festive mood continues through Durga Puja, Fullmoon of Ashwin, Diwali and so on for over a couple of months till the full moon of Kartik. I have only been to Durga Puja in Delhi and I am sure that’s not even half as fancy and happening as in Kolkata. We do have a lot of Bengalis in Delhi and I agree with you, that the vibe during Durga Puja, especially in certain areas where they have the puja pandals is so much more happening than during Diwali, which is more family affair than community. I am not very fond of crowds, to be honest, but I’m sure Durga Puja in Kolkata will be an experience of a lifetime. This sounds like a vibrant and colourful festival! I’ve never been to India, and so am so interested to read about your traditions there. Love the photos too! I have been away from home since so many years, I still miss those days when I used to have so much fun in Kolkata. Next week is the Pujas and I am gonna miss it big time. It always amazes me how people put so much of effort behind these grand festivals. 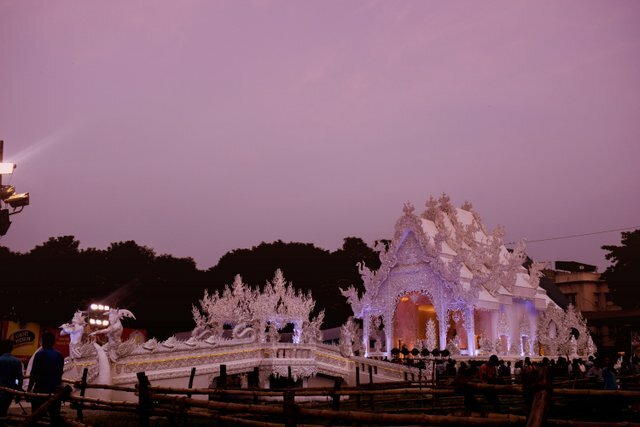 The Chiang Rai white temple pandal was put up last year in Deshapriya Park, that’s in my neighborhood. I guess you have mistaken the name to be Deshbandhu Park. But never mind, hope you have a great puja ahead. My Bengali friends are always so excited around Durga Puja time. I can see why in this post.